Jake gets such a kick out of being my sous chef that I let him pick my last project for #RecipeMakeover week. He picked brownies. Challenge accepted. These, admittedly, still aren’t the healthiest brownies ever – but they’re a solid step in the right direction. This recipe uses less sweeteners than most and sneaks in some sweet potato to boot. And while I didn’t plan it this way, they’re vegan, too. I mashed my sweet potatoes with a fork so they were still a little lumpy going into the batter. 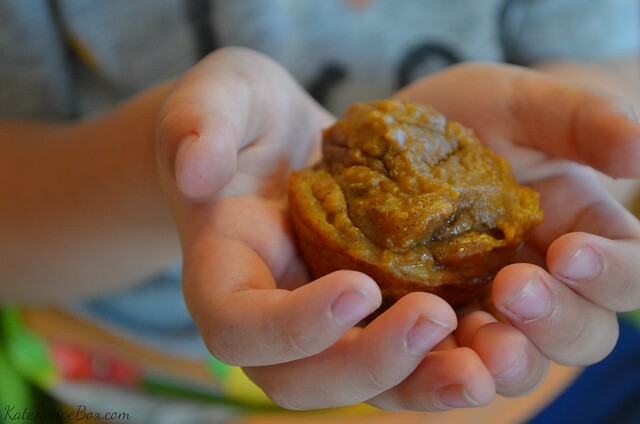 Jake isn’t picky (and is thrilled with anything chocolate), so he didn’t mind at all, but if you’re catering to a finicky crowd, pureeing the sweet potatoes would be a better way to hide them! Preheat your oven to 325 degrees and line a 9×9 baking pan with parchment. In a medium bowl, whisk together the sugar, flour, cocoa powder, baking soda and salt. In a larger bowl, whisk together the almond butter, sweet potato, syrup and vanilla until well combined. Add the dry ingredients and stir just until everything is moistened. Fold in chocolate. Transfer to the prepared baking pan and smooth out evenly in the pan. Bake for 25-30 minutes, until the top looks dry and puffed. Cool completely before removing from the pan. Dust with additional cocoa powder, if desired. Every time I make a batch of muffins, I wonder why I don’t make them more often. And then we inhale them in about two days and I remember why they’re a “sometimes food.” Jake and I both loved these. I think he ate three the day I made them. The recipe calls for canned sweet potatoes but next time I’d go for just mashed sweet potatoes. 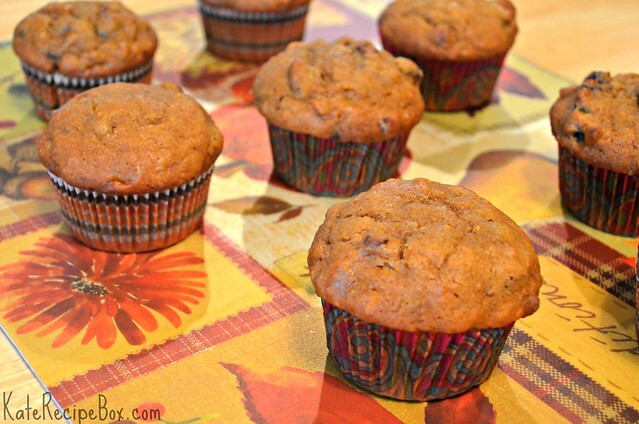 Also, the sugar can be reduced and the dates omitted if you like a less-sweet muffin. Preheat the oven to 350F degrees and prepare a muffin pan with liners or by greasing and flouring. In a large bowl, whisk together the flour, baking soda, salt and cinnamon. In another bowl, whisk together the eggs, sugars, vanilla and vegetable oil until well combined. Whisk in the sweet potatoes until evenly combined. Add the wet ingredients to the dry and stir until everything is moistened. Fold in dates and pecans. Divide between muffin wells and bake for 25-30 minutes, until a knife inserted comes out clean. This weekend, Babywearing International of Central NJ celebrated their first anniversary of becoming a Babywearing International chapter. If there’s one thing that’s saved my sanity during the past year, it’s baby wearing. I feel incredibly fortunate to have found this community so early in motherhood and that my local chapter is so awesome. Saturday’s celebration was a potluck picnic at a beautiful local park. This salad was my contribution to the feast. It’s something I’ve made before and have been meaning to make again since Jake is currently loving sweet potatoes and black beans. And this is one of the best potluck dishes I’ve found – it can be served warm, chilled or at room temperature and it’s gluten, nut and dairy free so it’s perfect for pretty much everyone. Stuck with leftovers? It also makes an awesome burrito filling! Peel the sweet potatoes and cube into bite-size pieces. Toss with olive oil and 1/2 tsp. of salt and spread on a baking sheet. Roast for about 20 minutes, until tender but not smushing, tossing halfway through. Remove and let cool for five minutes. While the sweet potatoes roast, rinse and drain the black beans. Whisk together lime juice, zest, remaining salt and cayenne in a large bowl. 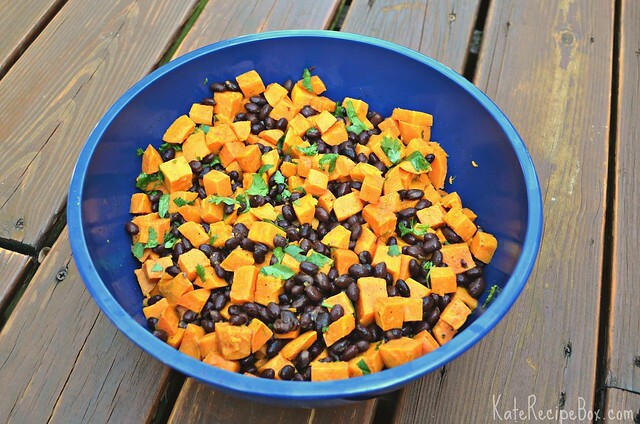 Toss with black beans and slightly-cooled sweet potatoes. Stir in cilantro. We’re two months into “real food” with Jake. So far he hates every green vegetable we’ve tried but will happily eat his weight in bananas, peaches and pears. It also means that Jake-friendly ingredients are making it into our menus more frequently. It’s a lot easier to cook up some sweet potatoes for him when I’m already prepping them for us – or mash up some avocado while I’m dicing it for dinner. Can you guess what he had for dinner the night we had these tacos? 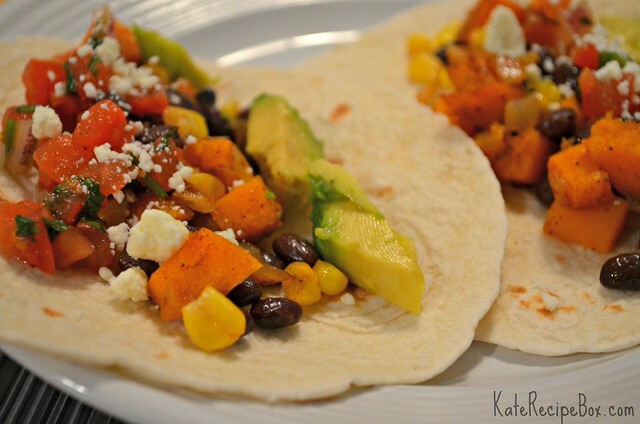 These are pretty similar to the Roasted Vegetable and Black Bean Burritos that I love. These ebb on the side of sweet instead of spicy (honey instead of jalapeno) so I think they’d be a little more kid-friendly. And adding fresh avocado and pico de gallo on top made them feel more fresh and almost summery. Definitely one of my favorite meatless meals this Lent! In a large bowl, toss the sweet potatoes with 3 Tbsp. olive oil to coat evenly. Add in the spices and toss to coat. Spread out the sweet potatoes on a foil-lined baking sheet and bake 15-20 minutes, until tender, tossing halfway through. In a large skillet, heat the remaining olive oil until shimmering. Add the onion and cook 5 minutes, until beginning to brown on the edges. Stir in the garlic and cook an additional 30 seconds, until fragrant. Reduce heat and add in black beans, corn, honey and lime juice. Heat until warmed through and add in sweet potatoes. Serve in tortillas topped with feta, avocado and pico de gallo.